Simon Smith grew up, and still lives (with his wife and daughter) in the town of Port Talbot, sandwiched between the hills and the sea of the South Wales coast. Growing up in the Eighties, he would spend all available time playing and lurking in the docklands and lakes near to his home, ferreting about in the nearest vacant patch of muck, like something out of an early Heaney poem. He was rarely seen by his parents between the hours of dawn and dusk. It wasn’t until his grandfather turned him on to fishing that things really started to change. After that, his parents never saw him at all, almost having to resort to feeding 'that feral child' via saucers of food on the doorstep. 'Every moment not spent fishing is a moment wasted' could happily summarise his outlook on life in those days - and, although adult responsibilities have since firmly taken root, such reckless mischief is something he does his best to return to whenever he gets the chance. 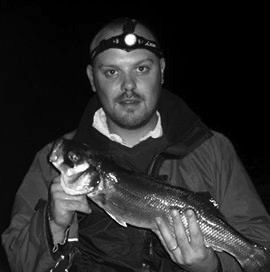 When not teaching English in a local comprehensive school, Simon spends most of his time writing poetry and essays about angling, and doing his best to look effortlessly nonchalant while standing like an idiot on a deserted beach in driving rain and a force seven gale. Oh, and a few bottles of real ale occasionally find their way into the mix too.